Oghenekewe Innocent Akinnawo, Kemka Godseat Amadi, Revelation Macaulay, Damilola Adedoyin Oyinloye, Mary Ndubuisi and Jennifer Vandi. It would be recalled that recently, operatives of the Economic and Financial Crimes Commission, EFCC, Ibadan zonal office have arrested 19 suspected internet fraudsters at Ologuneru Area of the metropolitan city of Ibadan and at Akobo, Ibadan, Oyo State. They are, Bamidele Ayodele Samson, Bamidele Philip, Tunji Oladapo Sowale, Bololaji Olalekan and Abdulrauf Abiodun. Others are: Olaleye Pelumi, Anuokuwapo Olanrewaju, Paul Damilola, Olateye David Tobi, Arewa Adekunle Ibrahim, Oyesanmi Ayomikun Oluwaseun, Olaleye Israel, Adediran Kemisola, Omobolade Alarape and Olowolusi Oluwatomisin. The four other suspects arrested early hours of Friday, February 1, 2019 at their hideout at Akobo, Ibadan are, Babatunde Afeez, Akorede Ahmed Olalekan, Adeleye Damilola and Moshod Richard. In a sting operation led by the zonal head, Friday Ebelo, Ibadan zonal head, the suspects who are between the ages of 21 and 35 years were taken by surprise when operatives swept on them at one of their notorious havens in the city. Five of them allegedly claimed to be undergraduates while the other 10 claimed to be self-employed in varied vocations. They are already helping operatives with useful information. The Commission got wind of their activities following series of the intelligence report, alleging that they engaged in various fraudulent activities ranging from obtaining money by false pretences through sending of scam emails to unsuspecting victims mostly in the United States of America, while others were engaged in romance scam on several dating sites. 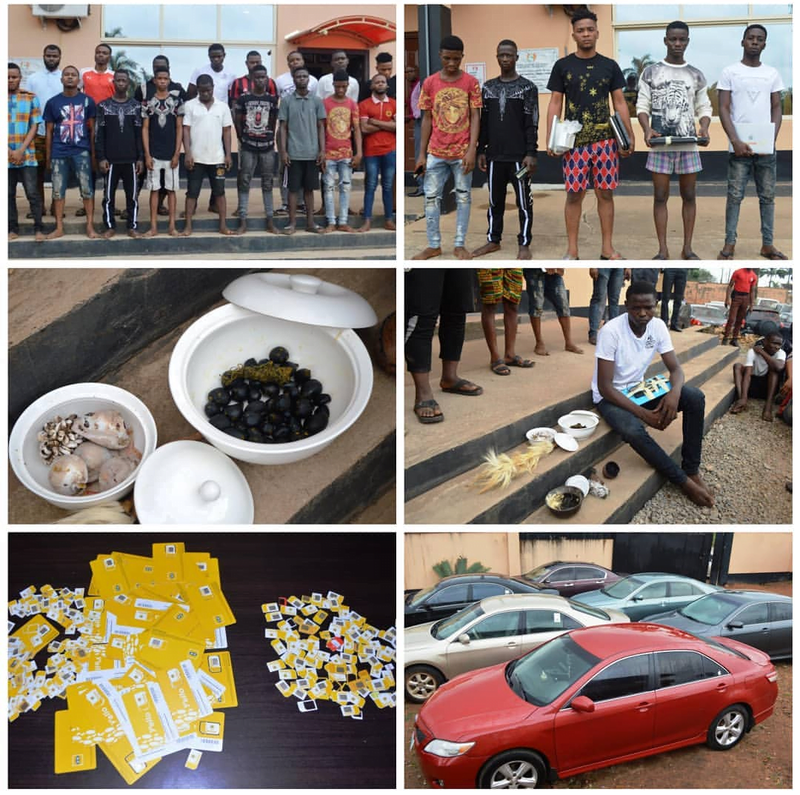 At the point of arrest, EFCC operatives recovered four different models and brands of exotic cars, five laptops, 20 telephones (10 iPhones) and one small bag containing items suspected to be fetish objects (juju) from them. Several documents, including international passports, and ATM cards were recovered from them. They will all soon be charged to court.